To answer these kinds of questions, Zack Knight’s lab at UCSF uses mice as a model and records the activity of excitatory neurons in a brain region called SFO (referred to as the SFO neurons below). These SFO neurons have been previously shown to drive avid drinking in fully hydrated mice when stimulated optogenetically1. This new work2, led by Zack’s graduate student Christopher Zimmerman, begins by showing that the activity of the SFO neurons behaves exactly as what one expects from the thirst drive. Their activity increases dramatically after the injection of either salt solutions (which increases blood osmolarity) or a drug that reduces blood volume (which normally happens during dehydration). Both phenomena are to be expected from the classic thirst homeostatic model. The homeostatic model fell apart when Zimmerman et al. found that the SFO neurons’ activity decreased dramatically minutes after a thirsty mouse started drinking and stayed low after (Figure 1). This is in contrast to the blood osmolarity level, which does not start decreasing until later. When looked at in detail, the SFO neurons’ activity starts decreasing when the animal starts licking (i.e. drinking) water. These results suggest that sensory inputs from mouth directly tell the SFO neurons that the animal is drinking water, therefore dampening down the thirst drive in anticipation of a drop in blood osmolarity and an increase in blood volume. If sensory inputs from mouth alone can instruct thirst, one should be able to decrease SFO neurons’ activity without letting the animal drink any water. Indeed, Zimmerman et al. found that oral cooling, a procedure that has been reported to reduce thirst in humans, transiently decreases SFO neurons’ activity in a thirsty mouse. This suggests that thirst drive can change on a fast and a slow scale because it receives two streams of information about water consumption: fast information from the mouth and slow information from the blood. If fast and slow information about drinking controls SFO neurons’ activity, what happens if these two streams of information are in conflict with each other? To test this, Zimmerman et al. 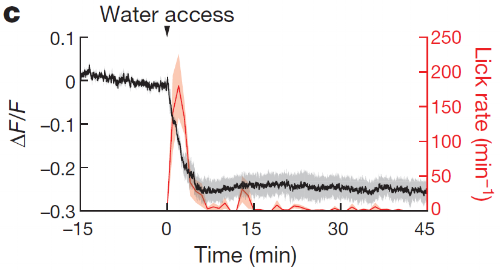 let a thirsty mouse drink high-osmolarity saline, which is mostly water but does not quench thirst, and find that the SFO neurons’ activity initially drops and then recovers during the process. Now, we can explain these results. The fast sensory inputs from mouth get to the SFO first, relaying information about drinking, but then the slow information about blood osmolarity catches up, updating the SFO neurons with the actual osmolarity state of the animal. Oka, Y., Ye, M. & Zuker, C. S. Thirst driving and suppressing signals encoded by distinct neural populations in the brain. Nature520, 349–352 (2015).